Today, the continuously extended range of fire doors includes a wide variety of steel fire doors for various industrial, trade and commercial requirements. According to the specified building situations or the individual demands, the various door systems are the perfect solution. 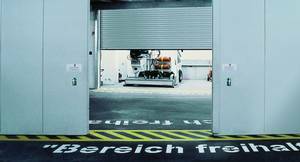 State-of-the-art drive and control systems guarantee simple and safe door operation with automatic closing in case of a fire or power cut. First class materials and excellent workmanship guarantee quality, reliability and long service life. Teckentrup fire doors are tested in accordance with DIN 4102.